I’ve got a ticket to the Australian F1 GP held here in Melbourne this weekend. My seat is in the Jones stand, which is supposedly one of the best stands. The Brabham stand on the opposite side of the track would have seemed a little better, though. Anyway, my seat provides a close view of the cars (10-15 metres distance), and is in the first corner so there’s going to be plenty of action on Sunday. The thing that would make the higher-row seats in the Brabham stand better is that the protective fence would not get in the way when taking pictures. It is almost useless to try to take photos from where I’m sitting. Then again, the cars look better on TV anyway than in my photos, so I’ve decided not to bother, at least for the most part. One thing I have to say about the event is that there isn’t enough signs available that would help in determining where to go. Arriving on Thursday at gate 8, which is on the opposite side of the track, it took me a while to find the Jones stand. Once there, I had to wander around a bit as well pondering about the seat numbers that were way off the mark. Ultimately I asked a nice young lady where exactly my seat was, and found it. On Thursday there wasn’t much interesting happening around the circuit. The more interesting events included V8 Supercars and Australian GT qualifying. Once the F1 cars hit the track on Friday, I lost the mild interest towards these two minor series. The cars in those series looked nice though. I missed the first practice on Friday for the most part due to leaving from my hotel too late. While waiting for the second practice to start, I wandered around the circuit and took a shitload of photos of the various cars on display. There was also the car from the Back To The Future movie trilogy, a DeLorean. Don’t know if it was the real deal or a replica, though. Pictures are available on Picasa. The McLarens took the first two places, with Hamilton first and Button second, while Kovalainen was on the 18th place. It rained a bit on a few occasions as well. I had risked it going there today without a raincoat, and it backfired a bit. Not too bad, though. Tomorrow should be better weather-wise. All in all, it is pretty difficult to follow the action on the track because you really can’t see much from the screens, where the times are displayed. The screens should be at least twice as wide and high to be of any use. I don’t think that would be too unfeasible either with today’s technology. I think going to an F1 race is worth it only for the fanatics. For the rest of us, the best experience is right in front of television. I don’t think I’m going to attend an F1 race any time soon, and if I am, I’m definitely not going to purchase a full weekend ticket. Saturday (qualifying) and Sunday (race) will do more than well. Oh and by the way, the smoke detector went off again tonight. This time I was toasting two slices of bread, and no smoke whatsoever was detectable by human senses. The hotel is bound to get some feedback. When I arrived here at Rydges Bell City hotel in Melbourne, I checked out the guest information book in the room. There it said that the rooms are equipped with smoke detectors, and if they go off, the local fire squad will be alerted and they will send one or more fire trucks to the site of fire, for which the guest will be financially responsible. The prices were something like $1600 upwards. So I’m merrily frying the mincemeat steaks I bought today, and off goes the smoke alarm! Granted, there was smoke in the room despite me having the air duct above the hot plates at maximum power. I promptly took the frying pan off the plate and threw the steak away, while the alarm was beeping for good 20 seconds more. I tried to disable the alarm by frantically pressing the only button on it. Eventually it stopped. Next thing you know, I open the window and start sweating about the fire squad. When will they arrive? How much I’m going to have to pay for my dinner (it better be good)? I can hear the distant sound of sirens coming from somewhere, but I soon realise that they’re just in my head. Time passes, but no fire trucks arrive. Some more time passes, and I start to think that the warning about smoke in the room in the guest information book was maybe a little too drastic. This hotel has hundreds of guest rooms, and I’d guess there’s maybe one or two fire alarms going off every week. Since the alarm in my case lasted for only about 20 seconds, I reckon the fire squad knew it was some idiot European cook at it again. The smoke detector is about 2 metres away from the hot plates. Maybe it could be placed somewhere where it wouldn’t have the potential to cause as many nuisance alarms. And the hotel should definitely provide guests with lids for the frying pans, for crying out loud! I arrived at Melbourne on Sunday. I’m staying at the Rydges Bell City hotel, which is quite nice, definitely a step up from the Medina hotel I stayed in in Sydney. Not that the Medina hotel was any bad, but still. On the day of arrival, I checked out the Preston suburb a bit. I found a KFC and popped in. They didn’t have any food made of beef, so I ordered a burger that looked ok’ish, and ended up getting a chicken burger with chips. Then I remembered that KFC stands for Kentucky Fried Chicken, which somewhat explains the no-beef thing. This was my first time in a KFC by the way, and as a beef lover I don’t think I’m going back any time soon. Not that chicken is bad, quite the contrary. Rice and chicken is teh good, while chicken doesn’t go together too well with hamburgers. It was certainly edible, but still meh. I bought a weekly MetCard ticket for Zone 1, which allows me to travel between the nearest train stop and the city centre. The trains are quite all right, but a little slow because there are so many stops in between. I still haven’t completely accustomed to looking right first when crossing the street, but fortunately there haven’t been any close calls. The nearest grocery store from my hotel is about one kilometer away. I have to cross several streets on my way there and back, so I get a lot of practice. And of course, there are plenty of streets to cross while in the city centre. Melbourne seems somewhat “calmer” and less busy than Sydney, in a way that it doesn’t give out quite as hectic a feeling. Then again, it might just be me. The great thing about both cities is that the calm streets/areas are never too far away. In Sydney, the Royal Botanic Gardens is a haven of tranquility just a few blocks away, and there are plenty of parks in Melbourne as well. There certainly are a plethora of shopping opportunities in Melbourne. You can’t be so rich as to not go broke if you just start impulse shopping everything. But I’ve not found sport shorts for exercising as of yet. There’s supposed to be a big sports store at the basement level of the Melbourne Centre shopping mall. Maybe I’ll go there tomorrow or the day after. There’s a pool at the hotel resort, which I’m planning to check out tomorrow. If the weather is sunny, I’ll probably hang around the poolside as well for some time, given that my sunburns from Bondi beach have sufficiently healed. I made a visit to the Australian National Maritime Museum yesterday. I don’t know if they had something indoors as well but I was mainly interested in the ships themselves. The ships I visited were the HMAS Vampire destroyer, the HMAS Onslow diesel-electric submarine and HMS Endeavour, a replica of Captain Cook’s ship. There were volunteers giving guided tours on all of the ships, which greatly enriched the experience. The guides were either former Australian Navy officers or passionate civilian mariners who really knew their stuff. On Vampire, there was a guide who had actually been enlisted on the ship back in the 60’s, and his stories were thus certainly worth listening to. I snapped a few photos from this trip as well, they’re available on Picasa. Not any of Onslow’s interiors I’m afraid, because it was just too cramped to get any decent shots. I decided to hit the famed Bondi Beach yesterday. I first had to spend about half an hour figuring out how exactly to get there (and how much it would cost), and finally found the 380/1/2 & 333 buses which go from Circular Quay to Bondi and back. They actually go farther than Bondi but they were just the perfect routes for me. 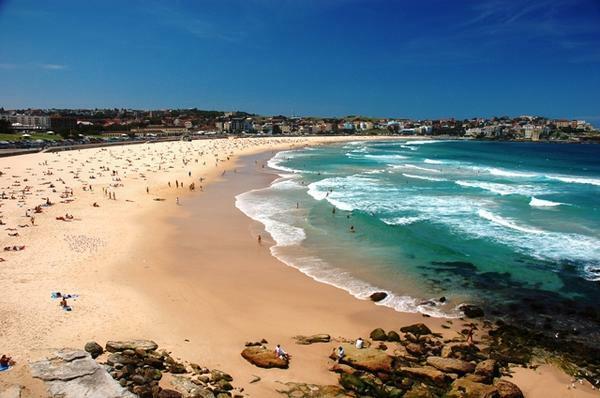 The arrival at the Bondi Beach presented me with a picturesque view (the photo’s from Google since I didn’t bring my camera.) I immediately recognized the beach from the numerous photographs I had seen while researching my trip to Australia, so there was no danger of not jumping off the bus at the right stop. There are actually three stops next to the beach, and a lot of passengers are hopping off at the beach, so one really can’t miss it. Once there, the beach didn’t really seem like anything special. Then again, a beach is a beach is a beach. There were plenty of surfers giving it a go, and a bunch of sunbathers. It was a normal working day in the autumn so I guess the beach is usually more packed with people during weekends. After getting a few sunburns courtesy of my unevenly spread sunscreen, I decided to go look for the bus stop in order to get back to my hotel. I also snatched a tasty sandwich from the local Subway once I was back at CBD. There’s a Subway in Oulu as well but I’ve never been there; this was in fact my first visit to a Subway ever. On another note, I’ve found the hotel’s gym to be adequate for a traveler’s needs. Nothing fancy, several aerobic equipment like a treadmill, a stepper and a couple of exercise bikes. I pedal 30 mins in the morning and then do some push-ups and sit-ups. Keeps me from falling completely out of shape. Today there were quite a lot of bats making lots of noise in the Royal Botanic Gardens. I could hear the shrieking from far away so I decided to check it out. It led me to a previously unexplored section of the gardens, which provided with several photo opportunities; unfortunately my camera was at the hotel. Having been here in Sydney for 10 days now, it feels like it would be a good time to switch to Melbourne now. I’ve basically visited all the attractions I planned in advance. Shopping doesn’t interest me, and neither does the nightlife since I know absolutely no one here to go out with. On Sunday morning I’ll be off to Melbourne, where the F1 event is from Thursday to Sunday next week. I might take a boat trip to Tasmania while there as well, if I can find a decent deal. Against all the best efforts of meteorologists, it was a bit drizzly today so I decided to visit the Sydney Aquarium located at the Darling Harbour. It was rather dark there so I was presented with a challenge of having my camera set properly in order to get some good shots. Eventually I had to discard most of the shots because of the lack of light and the fact that the fish decided not to respect my shooting efforts by not staying still. At the end of the tour I purchased a couple of postcards and a bookmark from a rather conveniently located souvenir shop. Once out, I purchased a hamburger meal from a local outlet. I got a small, peculiar looking ketchup container with the meal, which I eventually managed to open with only small drips of ketchup on my white shirt. The hamburger was a letdown but at least the fries were the default stuff. A set of shots is available at my Picasa album. The weather forecast shows mostly sunny for tomorrow morning and afternoon, so assuming the actual weather will reflect this, I’m planning to revisit the Royal Botanic Gardens again. Another visit I’m planning for a sunny day is a trip to the Taronga Zoo. By the way, I’m using a prepaid mobile broadband from a company called 3. Works decently and the recharges are not that expensive compared to alternatives. A 4GB recharge is $49. Once I get home I plan to upload bigger versions of the photos in my Picasa album; 1024×768 will have to suffice for now. Visited the Royal Botanic Gardens here at Sydney. I know nothing about horticulture but one doesn’t have to in order to be able to appreciate the impressive views. I was able to put the circular polarization filter on my Nikon D90 into good use on the bright sunny day. Pictures are available at Picasa. I hadn’t eaten much before going to the gardens in the morning so I eventually had to cut my visit short after exploring only about a third of the gardens. I plan to go back there as soon as the weather improves again. It’s overcast right now, and it rained a bit a while ago. One notable thing to mention is that as the traffic here in Australia is left-sided, the pedestrians tend to flock to the left side of the pavement as well. Coming from a country with right-sided traffic it was a bit weird at first. Apparently the local law doesn’t state on which side of the road you are supposed to walk, but people generally seem to stick to the left side. Another thing is that the pedestrians here don’t seem to respect red lights that much either. You can tell a local from their tendency to cross the road whenever they deem it to be safe. There’s quite a bit of traffic here and the cars aren’t driving too slowly either, so sometimes it looks a bit calamitous. When crossing a road the traffic light for pedestrians is first green but changes to a blinking red almost immediately afterwards. I guess it is safe to start crossing the street during a green light, but when the light starts to blink it may be too late. Sometimes the blinking phase will take quite a bit of time, so I tend to follow the locals when analysing if it’s safe to cross the street or not. I’m planning to visit the Sydney Aquarium today, since it seems that the sky will be overcast for the better part of the day, with a small chance for rain. I embarked on a long planned trip to Australia in the morning of 6th of March. I first traveled to Helsinki by a train (5.5 hours) and then took a plane to London (2.5 hours). Heathrow (terminal 3) was unsurprisingly busy with people all over the world coming and going. For the first time in my life I was in a place where I could hear people talk impeccable English. It was kind of like being in a British TV series or a movie or something. My next flight to Bangkok left in about three hours after arriving at Heathrow. It was a Boeing 747-400 plane. The economy class seats were narrow and there was not much legroom to speak of. The worst part was that I just wasn’t able to sleep sitting upright, and the seats didn’t allow much recline either. The armrests were narrow and shared with the neighbouring passengers, which didn’t help either. I arrived at Sydney in the morning of 8th of March. My check-in was at 2pm so I had to kill some 7 hours before being able to properly rest. After I finally got into my room I slept for 5 hours, waking up at about 9pm local time. Now being the third day here I’m a bit surprised at how easy it has been for me to adjust to the 9 hour time difference. They say that jet lag is harder to cope with when traveling eastwards. For me it was especially challenging because I hadn’t slept properly for about 36 hours. I almost fell asleep while sitting upright shortly before I was able to check in to my room. I took a few photos while wandering around Sydney on the first day. They’re available on Picasa.